However, I’ve also always struggled with this aspect of my temperament. I am choosy about who I intentionally reveal my feelings to and have struggled with expressing (or not expressing!) negative emotions. When my son was born, I vowed to learn more about how to help him learn about feelings and their healthy expression, and in the process I’ve learned a lot too – and the learning curve has been STEEP! This post is a collection of some of the best ideas and research that I have found for raising emotionally healthy kids. Amazon Affiliate links are included in this post. See Disclosure for full details. Feelings are what make us feel fully ALIVE and CONNECTED to others and the world. When we teach our kids to understand and express their emotions in healthy ways, it allows them to experience a more flexible, adaptive and stable inner life. It also puts them on the road to becoming more RESILIENT to mental illness. (Dan Siegel’s book, Mindsight: The New Science of Personal Transformation ). The biggest thing I’ve learned is that it’s not helpful to think of feelings as being good or bad. They just ARE. The more we can teach our kids to be in touch with them, accept them, understand them and then express them – the healthier they will be! When we empathize with our kids, we are validating their feelings. In essence, we are communicating to them that it’s OKAY to have negative feelings and to express them. If instead we ignore the feelings, don’t talk about them, dismiss them, minimize them, or get angry at the child, they will come to learn that feelings are best ignored and suppressed. A child who believes that expressing negative feelings is unacceptable will never be able to understand when someone else is expressing these feelings. Nor will they be able to, or want to, act to comfort them – the crux of empathy. According to Pam Leo, author of Connection Parenting: Parenting Through Connection Instead of Coercion, Through Love Instead of Fear the secret to empathizing with our kids is simply to acknowledge and accept their feelings – as soon as they appear. Make It OKAY for Your Child to Express ALL Emotions – especially the negative ones! Over at the Positive Parenting Connections blog, Nicole Schwarz has written an awesome post for parents experiencing confusion or stress when trying to empathize with their kids. This used to be me. If this is you, be sure to check it out here. You might also want to read more about Parenting Triggers if seeing and hearing your child upset makes you angry. When children are little, it’s easiest to first focus on teaching them to recognize the basic emotions of anger, sadness, fear, happiness, disgust, and surprise. As they grow – start using a variety of complex emotion words when you are talking about feelings. Discussing their meanings and nuances can help kids learn to distinguish them. 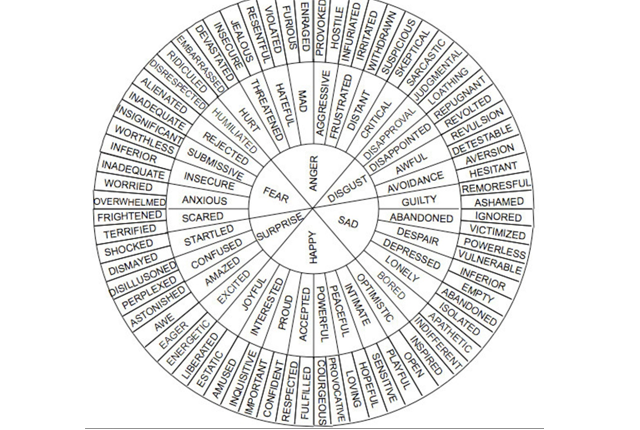 Check out this amazing emotions wheel for ideas! One of the easiest ways you can help kids learn about their own feelings is by labeling their feelings for them. After I learned this tip, I started doing it a lot with my son. By the age of 3, Onetime was very good at labelling his OWN feelings, and at letting me know if I had gotten them wrong! Dan Siegel refers to this strategy as “Name it to Tame it” in his wonderful parenting book The Whole-Brain Child: 12 Revolutionary Strategies to Nurture Your Child’s Developing Mind . 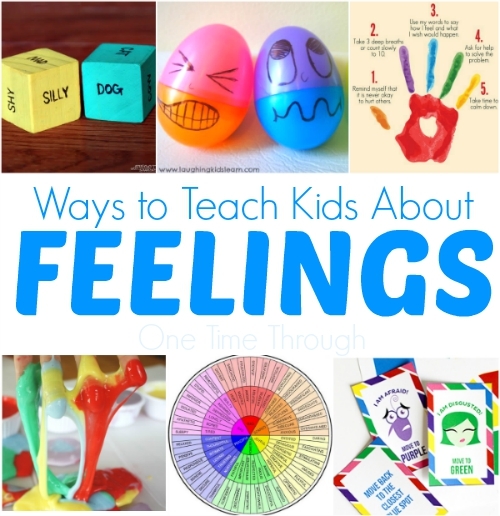 You may also want to check out this free Feelings Game and Feelings Sheet which you can use to help your kids learn to identify their own feelings. You can help your child develop emotional recognition skills and empathy every day with a few simple strategies. When kids are in conflict with each other, draw their attention to how the other child is feeling. It can be helpful to talk with children about the reasons why we feel certain ways. Don’t try to have these discussions during, or soon after, a strong negative emotion has occurred. Instead pick a neutral time to casually bring these ideas up – maybe when you’re reading a book together, or noticing someone else’s emotional behaviour. Feelings evolved for the purpose of driving us to behave in ways that PROTECT us. If we look at the 6 basic emotions that are present in humans from infancy, we can see why these emotions are common to all cultures. Allows us to connect and share and bond. Laughter allows us to release tensions and stresses. Happiness may also allow our brains relax so that we can become open to a broader awareness of things – which in turn, allows us to learn and problem-solve more effectively. Tells our bodies to slow down and reflect. It helps us process the deep meaning of events and relationships. It allows us to let go of things we have lost. Tears actually help our bodies release the stress-hormone cortisol, and stimulate the production of endorphins which make us feel better! That’s why a good cry often makes us feel better! Fuels our body to fight and stick up for ourselves when we are being challenged by another person or people. It may give us a needed burst of strength to defend ourselves, or to attack. It may even allow us to bargain more effectively with others! Allows us to stop what we’re doing and focus when something new or important occurs. If the surprising event is negative, it pumps us full of adrenaline so that we can either escape or fight. Prevents us from engaging in activities which are usually unhealthy for us. Research shows that disgust helps us avoid eating things that are toxic, and likely to be contaminated with germs. Sounds like a healthy feeling to me! Acts as a danger signal. It lets us know when there is a real or possible threat to our persons or our self-esteem. It also triggers adaptive responses to help deal with these threats, such as anger, or the fight-or-flight response. Fear even warns us when our personal boundaries have been crossed, as well as our emotional boundaries. When we share our happiness, it becomes contagious. When we share our sadness, we can receive much-needed comfort. However, when we share our anger – especially if we have suppressed it for too long – we often get hostile responses from others. Usually this is because we have not expressed the true feeling underneath the anger (usually a hurt of some kind). If we can teach our kids to express the hurts when they feel them, in appropriate and assertive ways, before the anger bubbles out of control, we are giving them a proactive tool that will allow them to communicate better with others their entire lives. When they are upset, disappointed, or hurt – prompt them to use their words to express it as soon as possible. “I feel… (State your emotion) when you…. (describe their behaviour or under what conditions you feel this way) because I want/I need… (explain why their behaviour or the conditions leads you to feel this way). For more examples of I-statements, visit this site. Securely attached children are typically happier and more socially skilled, competent, compliant, and empathetic than children who were insecurely attached as infants. They may also be more popular with their peers, have higher self-esteem, and be less dependent and negative. 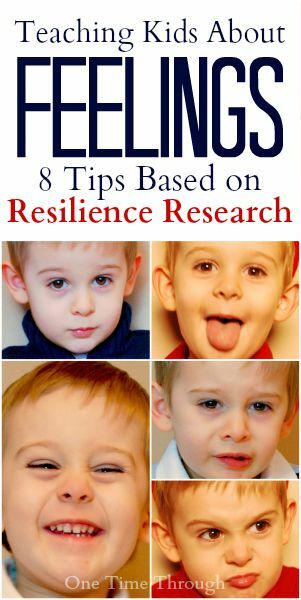 Find a huge list of games, activities and books that you can read with kids to help develop emotional intelligence at: Best Parent Resources to Teach Kids About Feelings. Teach your kids that although they cannot control how they feel, they CAN control what they think. Teach them how thinking certain thoughts can lead them to feeling certain ways, and how viewing things in a different way, can lead to them to feel more positive. Read 30+ Phrases to Say to Kids to Boost Their Resilience to find examples of things you can say to your kids to model and encourage these types of positive and resilient thinking. Please PIN this and SHARE the information with your friends! That brings us to the end of my tips for teaching kids to value and accept feelings. As parents and educators, we are in a unique position to be able to model and encourage emotional health and resilience. I hope you have found some helpful ideas here today! 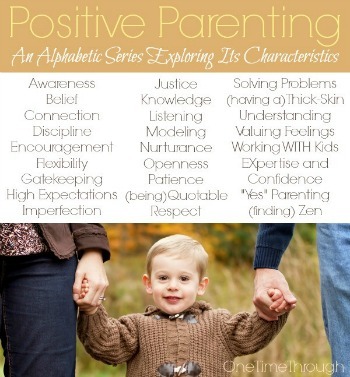 Today’s post was the V is for Valuing Feelings installment of my alphabetic parenting series. Find all of the other posts on the Positive Parenting page. I love hearing your thoughts and ideas! 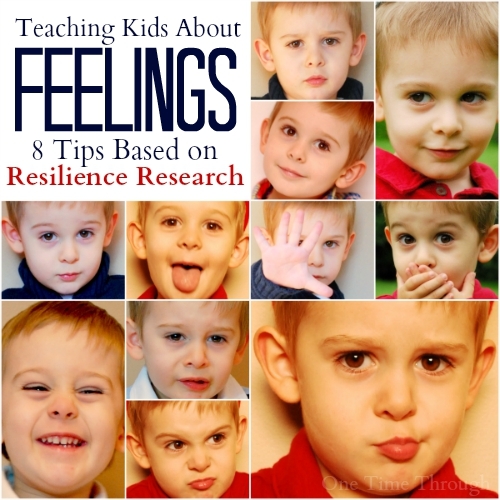 How do you teach your kids about feelings? Leave a comment below. Nice article that point few issues with the way we inhibit our kids emotional development. Still I’m in disagreement with you as I believe that we are not responsible for the emotional state of others. Our emotions are triggered by external happenings but the source is our image about the world. I would recommend you to read “Non violent Communication” by Marshal Rosenberg to get a full understanding of what I’m stating here. I wanted readers to know that I followed up on this book recommendation and read Non Violent Communication this summer. It is an excellent book that I highly recommend reading. I have updated some of the advice in this post to reflect a more positive way of teaching our kids to speak!